Native youth have been invited by the White House to attend a kickoff event for Generation Indigenous on April 23. Having worked on Native Youth issues for the better part of the decade, the Lakota People’s Law Project is growing more optimistic that federal officials are dedicating more attention and rhetoric to the enormous issues that young people face growing up on reservations. Whether that rhetoric transforms into necessary action remains to be seen. Different programs within Gen I have been established to help empower young Indian children. The Native Youth Community Projects, administered by the Department of Education, funds Native communities and helps students gain the skills needed for college and careers. The National Native Youth Network similarly helps Native youth by providing peer support and by teaching leadership skills. There is also the Gen I Youth Challenge which encourages Native youth, tribal leaders, schools and businesses to come together and make a difference in their communities. But it doesn’t stop there. 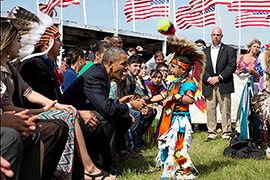 The White House will hold the first ever White House Tribal Youth Gathering this summer and will host hundreds of Native youth. Obama’s cabinet has also already kicked off its Native Youth Listening Tour in which cabinet members listen to both the stories of Native youth and to their suggestions on how to better their communities and education. By setting up these different programs to promote education and leadership, Gen I is providing Native youth with the opportunities they need to overcome their obstacles, all without taking away sovereignty from the tribes. In fact, the Department of Interior issued six tribes $1.2M to establish school systems run by the tribes. The STEM grant program was also established to improve the partnerships between tribes, states and school districts so that they may work together to meet the educational and cultural needs of Native students. Promoting sovereignty among the tribes has been and continues to be very important to the Lakota People’s Law Project (LPLP). In 2014, LPLP and A Positive Tomorrow (APT) worked together to successfully obtain federal planning grants for the Oglala Sioux Tribe and the Standing Rock Sioux Tribe, two of the largest tribes in South Dakota Indian County. By doing this, LPLP and APT ensured that these tribes can approach greater sovereignty when it comes to creating their own Child and Family Service Agencies and making decisions concerning Native children. Native children are the sacred future of their tribes, and it is important that we work with the tribes to help these children reach their fullest potential. By promoting education, community service, leadership, cultural respect, and tribal sovereignty, it is the hopes of Gen I to bring about a brighter future for the Native youth of America.